Denali, the summit of North America. The seven summits, the highest peaks of the 7 continents! Trips, Statistics & information! See the 7summits books page: Reading the Denali books and the instruction books such as Mountaineering: the freedom of the hills will prepare you for the Denali trip. Below are some direct links to the most important books. Kilimanjaro, Africa, one of the 7 summits! / The seven summits! Some are guidebooks, some are stories...do read some of both before you try it! See the Denali Guidebook page for more info here. Denali's West Buttress: A Climber's Guide to Mount McKinley's Classic Route By Colby Combs, photography by Bradford Washburn; the ultimate guide to the normal Route! Before, during and after climbing the West Buttress (normal) route, this was my bible. Don't leave home without it! Denali Climbing Guide by R. J. Secor contains all the possible Denali routes you can think of, with some general info, For experienced Denali climbers who want more than the West Buttress. Contains B&W photos and sketches. Amazing story of courage and survival, but also a good reminder of Denali's power and therefore also a good read before you decide on a 'summer climb'. Everything you need! This updated 7th edition of the mountaineering classic is an essential reference for novices and experts alike. Chapters are devoted to in-depth discussions of outdoors fundamentals; climbing techniques for rock, snow, and ice; safety procedures and emergency response; geology and weather; and appendices for climb ratings and supplementary reading, among other topics. Detailed sections on navigation, ropes, knots, and protection include drawings, diagrams, and maps. Enjoy the freedom of the hills to the fullest with this thorough guide. This is more a fact book than an adventure book. 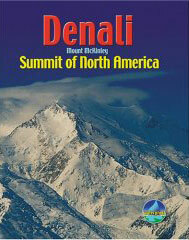 If you want to know ,more about Denali than just stories or want to write your own story or essay, this is your book. This is the only collection of detailed topographic maps covering all of Alaska! When you want to drive the Alaska highway or do some hikes, you will need maps like these. by Frederick A. Cook 90th (from Amazon:)"Anniversary reprint edition of Cook's account of the first ascent of Mt. McKinley in 1906. The first to circumnavagate McKinley in 1903, Cook's claim would later be rejected by many, but in 1994 an expedition followed his route and determined that he had been where he described in his 1907 first edition. Contributions and maps by the 1994 Ruth Glacier Expedition and new photos along with the first publication of Cook's diary and index."